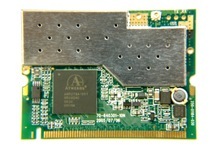 The XG-623 is an IEEE 802.11g 54Mbps mini PCI module that has been designed with the integration market in mind. With its low profile external antenna connector and standard mini PCI form, the XG-623 will fit into any design that supports the mini-PCI form factor. The XG-623’s reliable design helps to reduce overall costs associated with wireless integration by eliminating the need for debugging and driver support commonly associated with designing a product from the “ground up”. The XG-623 module is a robust plug and play ready device that has support for both windows and Linux operating systems.